E-readers offer a host of benefits to those who suffer from low-vision or arthritis issues, but many older Americans still prefer an old-fashioned paperback. Did you get an electronic reader (e-reader) for Christmas? Is it still in the box? If it is, you’re probably not alone. Many older adults prefer to avoid technology for as long as possible, and if that’s you, that’s OK. Even if the kids expect it and all of your friends are doing it, there’s nothing that says you have to give in to technology. But before you give up on it completely, there are some things about that e-reader that you might want to know. Maybe you’re not tech-averse, but you’ve heard stories about how difficult e-readers are to use, or how they can cause eye strain. However, you are intrigued by that little device and the fact that maybe it will make it possible for you to read again. The good news is, using an e-reader might be easier than you thought. E-Readers Versus Paperbacks: Which is Better? According to PEW Research Center, only about 19 percent of Americans over the age of 65 own an e-reader. In part, this is because older adults are adopting multi-use tablets instead of single-use e-readers. Another reason more older adults don’t own e-readers, however, is a life-long love of the printed word. Nothing beats the experience of cracking the spine on a brand-new paperback book, inhaling the musty scent of the pages combined with the sharp twang of the ink, and settling down to enjoy a really good story. Paperbacks still have their place; the tactile nature of a book is its greatest appeal. E-readers, on the other hand, also have some benefits. You can keep an entire library on an e-book. Most have enough storage capacity to hold thousands of books. You can download books from your local library. You can use the e-reader’s internet capabilities to access your local library system, reserve books and automatically download books to your e-reader. This feature – particularly during winter months when weather is bad – can keep you reading even when you can’t get out of your home. You can adjust the font size and page colors of most e-books. This makes it easier for people who suffer from vision problems to continue reading long after a paperback is feasible. E-books are lighter and often easier to manage than a paperback. If you suffer from arthritis that makes it difficult or painful to hold a paperback book for long periods of time, an e-book might be a good solution to allow those marathon reading binges that you love. The e-ink technology (a special electronic ink that makes screens easier to read) found in many of today’s e-books makes it possible to use them indoors or out. As an added bonus, many e-books are now waterproof, so you can still read by the pool, at the beach or in the tub without fear of damaging the unit. E-books are actually easier to read than books. Experts once believed that e-readers caused eye strain, but studies now show that the opposite is true, especially for models that use e-ink technology. Researchers have found that e-books reduce eye strain, and in turn, may improve mental function in older adults. Despite the similarities and differences, there is no one option that’s better than the other. If you love reading a paperback book, and it still works for you, then that is absolutely the option you should choose. But don’t write off e-readers completely, because there may come a time when an e-book offers you the ability to continue reading where a paperback will not. Maybe you don’t have an e-reader hidden away in a box, but you want one. What features should you look for? First, consider how you want to use the device. Will you usually only read indoors? At night or during the day? Some e-readers are better designed for indoors, some for outdoors; some have features that make reading at night impossible. Ensure you know how you plan to use the device, because that will determine the features that you need. Next, look for something that is comfortable to use. Try a few different e-readers to find one that’s the right size and weight for you. E-readers come in various sizes, ranging from around 6–12 inches. The larger an e-reader, the heavier it will be, but the tradeoff is that larger devices offer more screen real estate for those who need larger type. Look for ease of use, too. Most e-readers are either touch-screen or have two or three buttons to operate them. Look for a device that has buttons that are comfortable for you to use. Also, check out backlight options if you plan to read at night, or look specifically for e-ink technology if you plan to regularly use the e-reader outside. Finally, talk to someone who can show you how the e-reader works – both for reading and purchasing books – before you buy it. Ask them to walk you through the features. Grandchildren are a great resource, and e-readers give you an opportunity to connect with younger family members. Don’t have grandkids? No problem. A good salesperson will be able to help you find an e-reader that’s comfortable and easy to use. 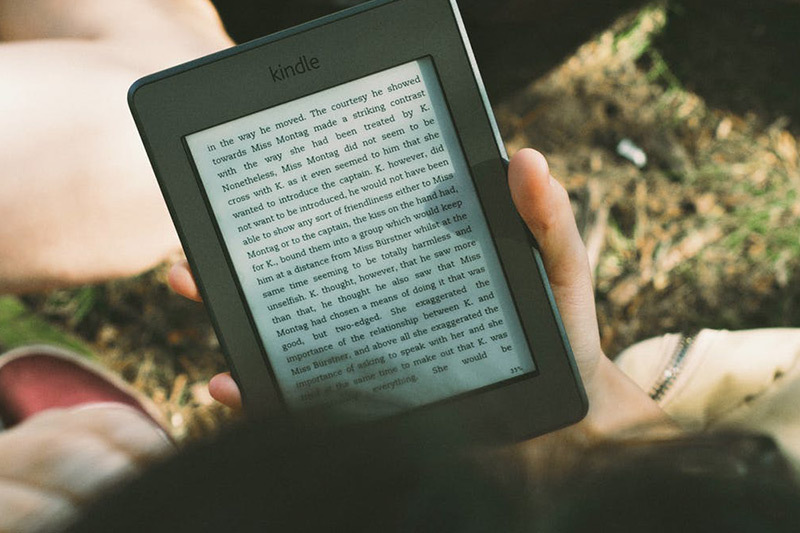 If you love reading, but have found that it’s getting harder to read printed books, consider an e-reader. They offer many benefits you won’t find in a paperback, and will allow you to keep reading the stories you love. “Seniors Gravitate Towards E-books?” Michael Kozlowski, February 2013, E-Reader. “E-readers for Seniors,” Spring 2010, Urban Libraries Counsel. “PEW: More Seniors Own Tablets or E-readers than Smartphones,” Sam Kirkland, April 2014, Poynter. “Senior Citizens Lead the Charge Toward the Adoption of E-books,” Rich Steeves, February 2013, TechZone360. “The Tech Devices Seniors Love,” Kimberly Barnes, Senior Lifestyle. “Technology Use Among Seniors,” Monica Anderson, May 2017, PEW Research Center.